That sounds like such an interesting idea for a book. I think I would watch a documentary like that - but not read the book. Great review. It sounds like a cool Halloween book. Yeah, I think the soul discussion would bother me, but the history of psychics and paranormal sounds interesting. Awesome!!!! I looooooooved Gulp by Roach and Packing for Mars by Roach. She's just such a great author! Hmm, I've never read her books before but this sounds like a really interesting book. Great review. Ill have to put it on my To Read list. I also liked the points about what you didn't like about it. I'm interested to read it to see if those bother me! My son would love these books, Now you have me going to research this author and all of her titles,. Thanks for sharing this, and I am glad you enjoyed it. It would be an interesting documentary. I could see it being on PBS. In fact, there was a series on PBS that looked at a crazy thing each week. I don't remember what it was called but there were episodes on spontaneous human combustion, the Loch Ness monster, and Big Foot to name a few. If I was going to read it again, I would just skip to chapter 3 and not read the soul chapters. October was definitely the perfect time of year to read this one. I love her writing style so much! She seems like she would be fun to hang out with. I am glad to hear that you like Gulp. The premise of the book seems weird, but I know I just need to trust that the book will be awesome. It really was a fun book. All of her books get pretty rave reviews, so even if you end up picking up a different book of hers, you will be amused. I am sure your son will like her books. I have not met a person who didn't at least like a Mary Roach book. She has written on a variety of interesting topics, so there is always a book of hers to fit a person's reading interests. Great review. I've thought several times about reading Stiff and this one as well but wasn't sure if it would be something I'd enjoy. I think I'll grab them for my shelf just in case. Your review makes me fairly sure that I want to read them both. 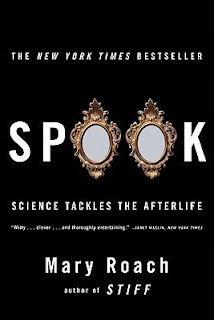 Mary Roach's books are lots of fun. Also, each chapter can be read on its own, so you can just jump in anywhere and see if it is something that interests you and then start at the beginning if you want. Stiff is definitely my favorite of all of her books that I have read so far, but I have heard good things about all of them.